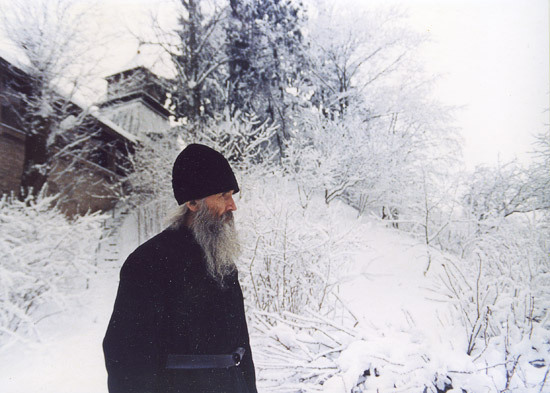 If, during the time that I was living there, someone had asked for the name of the most difficult person in the Monastery of the Pskov Caves, the answer without doubt would have been only one name: the Treasurer of the Pskov Caves Monastery, Archimandrite Father Nathaniel. What’s more, this choice would have been made unanimously by all the priests, by all the novices, all the monks, by all the ordinary civilians, by all the Communists from the local administration of the KGB, and even by all the local dissidents. As a matter of fact, Father Nathaniel was not merely difficult. No, indeed! He was extremely difficult! When I met him, he was a thin, elderly man with the keen, owlish, penetrating gaze of an elder. All year round he was dressed in an old and bedraggled monastic cassock with a torn hem. He usually carried an old canvas bag over his shoulders, in which just about anything might be found, ranging from moldy crumbs of dried bread given to him ages ago by some old grandmother, to perhaps one million rubles in cash. Either of these items in the eyes of this Father Treasurer of our monastery represented an extraordinary valuable that had been entrusted to our community by the Lord God Himself. All of these treasures Father Nathaniel would drag back and hide away somewhere in his innumerable secret cells and storerooms. The finances of the monastery were completely under the control and management of Father Nathaniel. And there were plenty of funds that needed to be spent: every single day up to 400 pilgrims and 100 monks sat down at our tables to be fed—and fed well. An incalculable quantity of repairs and construction and restoration to the monastery always needed to be conducted. On top of this, our brotherhood had constant daily needs. Moreover, we needed to help the poor, to receive our guests, and to give gifts to officials and bureaucrats . . . There were innumerable further expenses. How Father Nathaniel all by himself, without assistants, without com­puters or accountants or calculators, was able to deal impeccably with these numerous financial problems was something that no one could understand. Furthermore, he alone was responsible for all the many businesses con­ducted by the monastery, and all their paperwork. On top of that, he was responsible for the creation of the schedules and programs for the long daily services, for setting forth the duties of the monastery secretary, for answering the many letters of persons who were in correspondence with the monastery, often for all kinds of different reasons. As if this were not enough, he shared, together with the abbot of the monastery, all the generally unpleasant work involved in dealing with the official organs of the Soviet government. All of these tasks and duties, the mere listing of which would make a normal person quail and grow faint, Father Nathaniel faithfully executed with such inspiration and such scrupulous attention to detail that some of us sometimes doubted whether there was anything left of this man other than the consummate ecclesiastical bureaucrat. Yet in addition to all of these duties, our Father Treasurer was also respon­sible for the general supervision of us, the novices. And you may rest assured that he executed these duties as well with his invariable meticulousness: he snooped, he spied, he listened in on conversations, and in every way possible he diligently tried to discern whether we were worthy, whether we had committed some violation of the rules or otherwise harmed the monastery in any way. To be fair, it must be admitted that it was truly necessary to keep an eagle eye on us novices: most of us had come to the monastery from the outer world as typical good-for-nothings. Father Nathaniel also had one more fantastic quality about him: he always used to turn up exactly at the moment when we least expected him. If, for example, some of the young monastic novices were evading their duties and were hanging around somewhere by the ancient walls of the monastery to relax, chatter, and warm themselves in the sun—suddenly, as if out of thin air, Father Nathaniel would appear. Shaking his beard, he would begin in an unbearable grinding voice to scold. And by scold, I mean scold—so severely that the novices would wish that they could just disappear into the bowels of the earth, if only just to stop the torture. In his zeal, Father Nathaniel scarcely ate or slept. He was far more than a mere ascetic: for example, no one ever saw him have even so much as a cup of tea. He would simply drink cold water. And indeed at meals he would barely eat a fifth portion of whatever it was that was served to him. Nonetheless, every evening he would always appear at supper in the brothers’ refectory—not so much to eat, though, as entirely to ensure, as he sat before his near-empty plate, that order was being maintained everywhere exactly as it should be. All the while his energy was simply incredible. We had no idea when, if ever, he slept. Even at night we could see the light coming out through the shutters of his cell. The old monks said that when he was in his cell he either prayed or counted the heaps of rubles (mostly one-ruble notes and three-ruble notes collected during the day’s prayer services). All of these limitless riches he needed to accurately tie up in labeled packets of cash, while all of the coins also had to be sorted accurately into their own separate labeled pouches. As soon as he was finished with this, he would begin to write the program and the commentary for the next day’s service. There was no one in the monastery as fantastically acquainted with all the peculiarities and intricacies of the exact procedures required for the Orthodox Divine Liturgy in our monastery. Yet even if it so happened that the light in his cell was out, in no way whatsoever did this mean that we had the right to consider ourselves free of his strict supervision for even a moment. Not a chance! All night long, at any moment, Father Nathaniel might swoop down on us, here and there and everywhere, checking to make sure nobody was simply strolling around the monastery, which was absolutely strictly forbidden! I remember how one winter night we were sitting together in a group on the name day of one of our brotherhood. Our gathering went on till quite late. As we were all going back to our cells, suddenly out of the darkness emerged the dreaded figure of Father Nathaniel. We all froze in terror. But then we quickly all realized that on this particular occasion our Treasurer had not even seen us. In fact, his behavior was quite out of the ordinary. He could barely drag one foot after the other, and was staggering, barely able to keep up his canvas sack. Then we saw him climbing through a low fence of the forecourt—and… suddenly he lay down in the snow right on top of the flowerbed! “He’s dead!” some of us thought. We waited a little bit, and then cau­tiously, almost holding our breath, we approached him. Father Nathaniel was lying there in the snow—sleeping. Just sleeping, Evenly and smoothly breathing and even snoring a little bit . . . sleeping. Under his head was his sack, which he embraced with both hands. We decided not to go anywhere and not to leave him alone in that bitter cold until we saw what would happen next. We hid ourselves by the chapel over the holy well and started to wait. About an hour later, having nearly frozen ourselves, we saw how Father Nathaniel suddenly cheerfully lifted himself up, brushed the snow off of his sack and cassock, lifted his sack back up onto his back, then dashed off as if nothing had happened. At the time, we absolutely didn’t understand. It was only later that monks who had known the Treasurer a long time explained to us that Father Nathaniel had simply gotten tired and wanted to sleep more comfortably. More comfortably—in other words, for him. Meaning . . . with the wild luxury of lying down. Because in his own cell he would only sleep sitting. And in order not to indulge in this sinful luxury of lying in bed, if he had to lie down to sleep, he would only allow himself to sleep in the snow. Anyway, just about everything that had to do with the Treasurer of our Pskov Caves Monastery remained for us a total mystery. Difficult Father Nathaniel would never let anyone into his beloved interior world. Never mind his interior world—he wouldn’t even let anyone into his cell! This rule included even the all-powerful Father Superior of the monastery himself. You would have thought it completely unheard of for such an authority as our monastery head, Father Gabriel, to be unable to go wherever he pleased within his own monastery—especially considering the fact that the Treasurer’s cell wasn’t just located in any old place, but right on the first floor of the building in which the abbot himself resided—in fact, right below his lodging. You would have thought that of course the head of the monastery would never accept such an absurd situation. Well, one day the abbot of the monastery, after some feast day, while in a wonderful frame of mind, announced to Father Nathaniel that he would be dropping by immediately to have a cup of tea with Father Nathaniel in his cell. Several of our brotherhood who happened to be nearby at that moment immediately understood that something remarkable was about to take place, something that would dazzle the mind, soul, and entire human imagi­nation. To pass up a chance to witness such an event would have been unforgivable. And so, thanks to the curiosity of these witnesses, the curious story has been preserved. The abbot solemnly and determinedly crossed the courtyard of the monastery, proceeding implacably towards the cell of Father Nathaniel. But the Treasurer dragged his heels with a mincing gait behind, begging the abbot of the monastery to please change his mind about this plan. eloquently described the disorder in his cell, exclaimed that he had not cleaned it in twenty-six years, and warned that there was an un­bearably moldy stink in the air. the frightful mess of the dwelling place of the Treasurer. In spite of the irritation in his voice, it was clear that the abbot was truly just wracked by curiosity. Father Nathaniel understood at last that he had no way out, and therefore, he resigned himself. Indeed, unaccountably he suddenly cheered up, and with a merry tone in his voice said, “You are most welcome, Father Abbot.” Then he rattled his key chain and opened up before his boss that mysterious door which by now for over four decades had only been just sufficiently barely opened so as to briefly allow the slim figure of Father Nathaniel to slip through . . .
Pitch-black darkness like a complete abyss lurked beyond the threshold of the door. Both night and day the windows of Father Nathaniel’s cell remained completely shuttered. Father Nathaniel disappeared into the gloom. Indeed, it seemed as if he had been swallowed up by it. At least, not a sound could be heard coming out of the cell. But our abbot had long since vanished, well before this rambling speech had come to its end. Father Nathaniel, in spite of this incident, was an absolute model of obedience and wrote extremely long verse odes in honor of the Abbot and dear Father Superior of the glorious Pskov Caves Monastery. Indeed, he even wrote five-page sermons and moral teachings—also in verse. Father Nathaniel proved difficult to handle even for the mighty Soviet government, especially when it rudely attempted to interfere with our monastic life. It is said that none other than Father Nathaniel gave support and subtle advice to the great Father Superior and savior of the monastery Archimandrite Alipius, when the latter was under particularly heavy pres­sure from the crude persecutions of the Soviet authorities. This took place at the end of the 1960s. As you may know, all citizens of the Soviet Union were required to take part in “elections.” They brought a ballot box into the refectory of the monastery, where after dinner the brotherhood, under the discontented grumbling supervision of the abbot, rendered unto Caesar what was Caesar’s. But it turned out that the First Secretary of the Regional Communist Party Secretary for Pskov Province had found out that unheard of privileges were being given to these “savage” monks: they were being allowed to vote (unanimously, of course) for the one and only slot on the ballot, the Communist Party, over there, not at the local polling place like everyone else, but there in their obsolete historical ruin of a monastery! The First Secretary of the Communist Party was quite indignant about this and threw a fit, raging at his underlings and mercilessly rebuking them for allowing such unacceptable lenience to atavistic deviant non-working-class elements of society. He immediately demanded that from now on and forever those “black beetles” must come and “vote” for the members of the Supreme Soviet of the USSR like all good Soviet citizens, at their polls in their electoral districts strictly according to their place of residence! It was then, so people say, that Father Nathaniel whispered into the ear of the monastery’s abbot, Archimandrite Alipius, a piece of advice that was both innocent and extremely subtle in its defiance. On election day (and, as always, it was a Sunday), after the festal Liturgy was served in the monastery, from the monastery gates came stream­ing forth a magnificent procession of the cross, with priests bearing crosses and icons. Paired into two columns, in a long line singing hymns and in full ceremonial dress, the troops of monks paraded through the entire town towards the polling place. Their ancient banners fluttered in the wind as they marched, carrying their traditional crosses and ancient icons. But this was not all. As is the required custom before any important action, right in the middle of the polling place the entire clergy began to pray out loud. The bureaucrats were frightened to death and tried to protest against this, but Father Alipius firmly interrupted them, lecturing that they were interfering with citizens’ rights to express themselves and carry out their constitutional duties as they were required to do! Having “voted,” the monks marched back with similar ostentatious ceremony into their holy monastery. Needless to say, when the next elections came around, the ballot box was once again waiting for the monks on the table for the monastery refec­tory. Yet, by the same token, in his ceaselessly vigilant looking after us, Father Nathaniel always stopped us from uttering any outright expression of opposition to the Soviet regime, or from getting involved in any attempts at being a dissident. At first this seemed to us to be disgraceful. Why was our Treasurer simply kowtowing to hated authority? But gradually we began to find out that Father Nathaniel had been tested on numerous occa­sions by spies and agent provocateurs or plainclothes KGB operatives, ever seeking any excuse to do real damage to the monastery. And yet, even when he quite well understood that the expressions of dissenting thought were genuine, Father Nathaniel would always interrupt our beloved free opinions. And this was not only because he was thinking of how to protect the monastery. More likely he was protecting us from ourselves, from our temptation to be too passionate or fanatical in our youthful excess, which was chiefly mixed up with nothing more than pride. He had no use for mere words—even for the most heroic of words. Yet he knew all about Soviet authority, and about everything that was happening in the country—and not in the way we did, just from books and rumors. Father Nathaniel had a very sober and yet personal relationship to Soviet authority—perhaps because of the fact that his own father, the priest Nikolai Pospelov, had been shot to death for his faith in 1937. 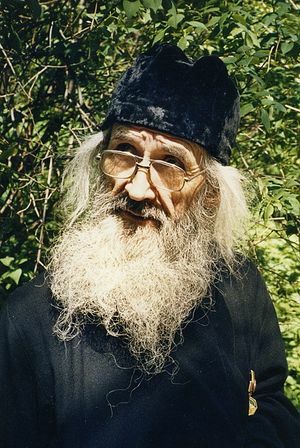 Father Nathaniel had served as a simple soldier throughout all of World War II, and then had served as a novice of the Great Abbot of our monastery, Archimandrite Alipius. He had also been the spiritual son of the holy elder and miracle worker of the Pskov Caves Monastery, Hieroschema-monk Simeon. Both of them, seeing in him a man of impeccable honesty and remarkably lively intelligence, had appointed him, even during those most difficult years of the persecution of the Russian Orthodox Church under Khrushchev, the Treasurer and presiding secretary of the monastery, effectively entrusting him with its most valuable secrets. Here’s another memory about his attitude towards Soviet authority. One summer night it was my duty to be the monk on the vigil in the square before the monastery’s Cathedral of the Dormition. The stars were twinkling dimly in the northern sky. Peace and quiet. The clock sounded three in the morning. What? Come again? Here we were in the Pskov Caves Monastery near Pskov. We were on Dormition Square. It was three o’clock in the morning. The stars were shining . . . Although Father Nathaniel always tried as hard as he could to stress that he was no more than a pedantic administrator, a dry and stern ecclesiastical bureaucrat, even we novices after a while began to grasp that his modesty carefully concealed his considerable spiritual gifts. This modesty was some­thing, by the way, that all the real monks in the monastery were endowed with. Our Father Treasurer had never become an official spiritual father in our monastery. Only a very few elderly people from the town of Pechory (or from even remoter regions, in the case of a few old-timers) ever came to say their confessions to him. Except for these few, he would not accept anyone else as his spiritual children, and would claim that he was not up to such a thing. But once, for a brief moment he slightly opened up a priceless part of his own soul—although he once again immediately hid it, with his usual curmudgeonly strictness. It happened when I made a mistake in performing one of my tasks. It seems I had been unforgivably casual in doing my duties. As a pun­ishment for this, the Father Superior of the monastery himself had assigned me for three days to sweep away the snow from the entire area of Dormition Square. At this, I became considerably annoyed—especially because snow just kept coming down, more snow, snow and snow and snow! By the third day I wasn’t just tired, but bone tired. I could barely drag one foot in front of another. I felt so sorry for myself that I took out my anger on the entire world, and was even beginning to nurse a plan for revenge. Of course, what sort of revenge can a novice take on the abbot of the monastery? The disparity in levels is so great it makes no sense. “Never better, Father Superior!” Then he would know that I was not broken so easily! This little scene of terrible revenge began to so truly warm my heart that even amidst my weariness during the ceaseless snowfall I began to feel significantly more cheerful. And when Father Nathaniel passed by I even smiled at him, hoping for a blessing in return. His reply was a wry grin and a surprisingly gentle sign of the cross, as if warding off evil. I bowed to kiss his hand and suddenly heard his reproachful voice. Lifting up his old sack full of one million rubles in cash, or perhaps just moldy old bread crumbs, he scraped along through the bitter frost and snow towards the main campus of the monastery. I was left standing with my mouth open. And you could only see how at each step the torn shoe sole of our Treasurer was flapping open. Oh! He was a real Scrooge! Except that he was a saint. 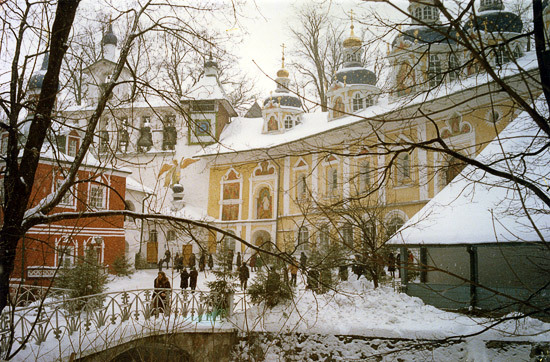 As one very respected elder of the Church in St. Petersburg said once: “Spending one year in the Pskov Caves Monastery is the same thing as spending fifty years in some seminary or theological academy.” Of course, whether we really learned our lessons—that is another, and to be honest, sometimes far more bitter question. By the way, Father Nathaniel truly was, no kidding, a man of legendary miserliness. Not only did he literally quiver over every least kopeck (penny) belonging to the monastery, but with a fury he would turn out any electric lights which he felt had no purpose to be lit, and would perpetually save water, gas, tea, biscuits, and indeed just about anything that could be scrimped and saved. He was also an absolute stickler for the upkeep of the age-old rituals, as vital to the survival of the monastery as the upkeep of the buttresses and foundations of the medieval buildings of the monk’s hermitages. He absolutely could not abide, for example, if any of our brotherhood ever went on vacation; he could not and would not accept it. He himself, of course, throughout all his fifty-five years of residence in the monastery, never once in his life took a single day off. Our abbot, Archimandrite Gabriel, also never once took a single day’s vacation, and looked sharply askance at anyone who dared to come to him with such requests. I do remember one time when our abbot gave his blessing to one monk who wished to take some time off for summer vacation. Well . . . that is, he gave his blessing. However, he instructed the poor hapless monk who had received it to go get money for his journey from our Treasurer. I was on night-vigil at Dormition Square and therefore happened to witness the scene. It began with this monk who was planning to take off for vacation knocking for a long, long, long time at the door of the cell of Father Nathaniel, and receiving no answer. Our Treasurer, having understood right away what the matter was, simply hid, but didn’t open the door. At this point the young priest decided to wait the Treasurer out. He sat down on a bench outside and began to wait. Four hours later, Father Nathaniel, with a wary glance around him, sneaked out onto the square. He was imme­­diately overtaken by the young priest, who showed him the written blessing of the abbot to give him money for his journey. The poor priest was so shocked he couldn’t stand up, and so squatted back down. Various foreign tourists who were in the square froze in amaze­ment. Utterly horrified, the poor young priest dashed off to his cell. Mean­while, the wise Father Superior, as he observed this scene from his window, watched with a very contented smile indeed. But we always received particular pleasure whenever we were given the task of helping Father Nathaniel in guiding excursions around the monastery. Generally, he was entrusted with taking extremely important people around the grounds. Our tasks as novices only involved opening and closing doors, and sometimes opening and unlocking the heavy church doors on the watchtowers and cathedrals. All the rest of the time we would just listen to Father Nathaniel. of wise, if sometimes mercilessly accurate, words had been inherited by Father Nathaniel. In those atheistic years, the Soviet bureaucrats who visited the monas­tery were itch­ing for any excuse to close it down: any sign of insanity, illness, psychological inadequacy, just about anything or any­­one would have served except what they actually found: unique but extremely interesting, erudite ­schol­ars, remark­ably daring and inter­­nally free men who actually knew far more about life than any­thing of which their guests had the least inkling. Within a few minutes the tour­ists generally realized that they had never met such men in their entire lives. Once in 1986 the Party bosses of the province of Pskov brought some big shot from the Ministry of Transportation to the monastery. It must be said that not all such conversations ended so pleasantly. Once a group of children of the top ranks of the Communist Party Central Committee came to our monastery. At least, it was so whispered to us—I have no idea whether this was true, but those young kids certainly weren’t well brought up. They were typical spoiled “golden Moscow youths” of the mid-1980s, the type of persons I knew all too well from my former life. These youngsters could barely contain themselves from mirth, pointing fingers at the monks, while asking the most idiotic questions—those same typical rude questions we were all so sick of. There was nothing that could be done, and Father Nathaniel patiently endured it as he showed them around the monastery. The excursion went on to the caves. By the entrance to them there is a tiny cell with a little window. In the beginning of the nineteenth century a hermit monk named Lazarus locked himself into that cell. He is buried there too. But above his gravestone, still preserved, hang his ascetic chains as well as his heavy iron cross. “But where did your Lazarus go to the toilet in a space this tiny?” interrupted one of the youngsters. His pals were all convulsed with laughter. Father Nathaniel patiently waited for them to calm down. He led the mystified tourists out from the cave and through all the grounds of the monastery into a section of the workshop and warehouse that was closed to visitors. Here, somewhat at a distance from the other buildings, was a foul old outhouse that had clearly seen better days. Then, leading the tourists around this structure in a half circle as one might when showing visitors a particularly valuable object in a museum, Father Nathaniel triumphantly pointed out the foul-smelling outdoor facility and said: “Father Lazarus once went to the toilet here! Now stand here and have a good look!” With this he turned his back to the astounded tourists and left them alone. You must realize this happened in 1984 (well before perestroika). Things weren’t so simple back then. The consequences could have been quite unpleasant. But then, the abbots of our Pskov Caves Monastery were extremely strong men. Difficult Father Nathaniel died with remarkable peace and tranquility. When the cardiologist suggested giving him a pacemaker, he begged the Father Superior not to allow it. I had the happiness of visiting Father Nathaniel not long before his demise, and was amazed by the ceaseless goodness and love now pouring out of that elder. Rather than hoarding the very last ounces of his strength, this incredibly miserly (in all other aspects of his life) and dry ecclesiastical pedant gave the very last ounce of himself to whatever person who, even for a few minutes, had been sent to him by the Lord God. Actually, come to think of it, this is how he had lived his entire life. Only we hadn’t under­stood it at the time. A hieroschema-monk is a monk who has reached the highest stage of monas­ti­cism—the great schema—but who is also a priest.